Happy Monday! It’s a perfect fall day here in Florida. Hope everyone enjoyed their weekend! Miss G is the only one in school today. She has a Rudi’s brand Cinnamon Raisin spelt bagel with almond butter & jam. I stuck on two candy eyes with almond butter. Next to the sandwich she has grapes and raspberries. The hair is Shirataki tofu noodles. The face reminds me a bit of Beeker from The Muppets. 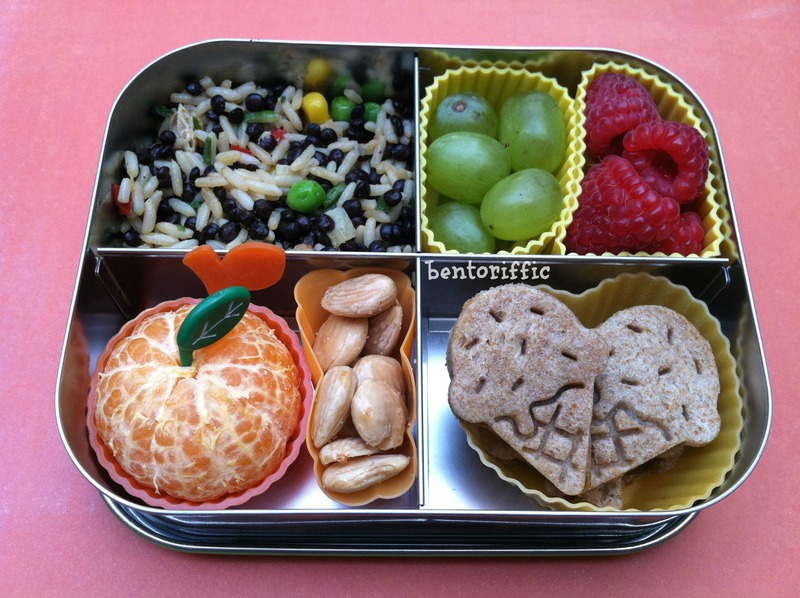 At the top left is leftover rice pilaf and the top right are watermelon pieces packed in her Easy LunchBoxes container. 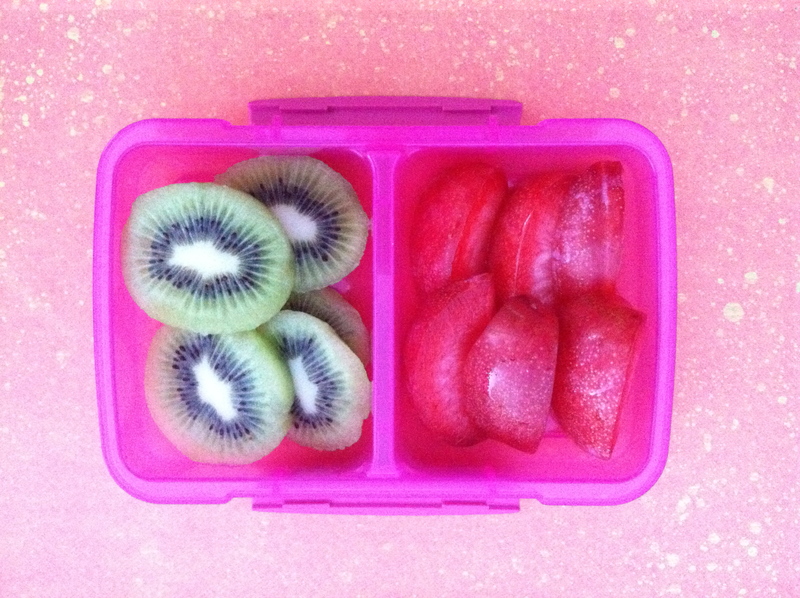 For her snack she has sliced kiwi and sections of Dapple Dandy Pluots packed in a sistema snack bento. 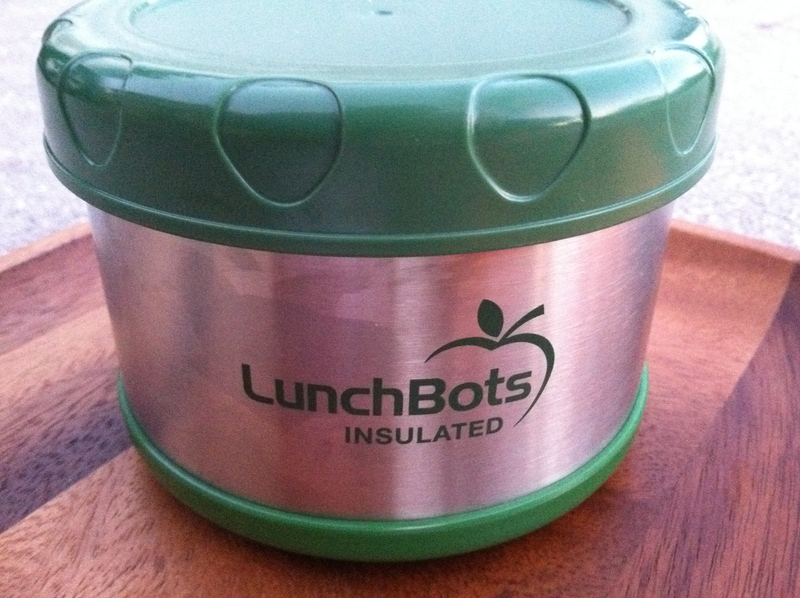 We recently got in our new LunchBots thermal insulated containers for winter soups & stews. It keeps foods hot of cold for hours. This morning I put in boiling water, let it stand in the container for about 10 minutes, poured it out and poured in the heated stew. 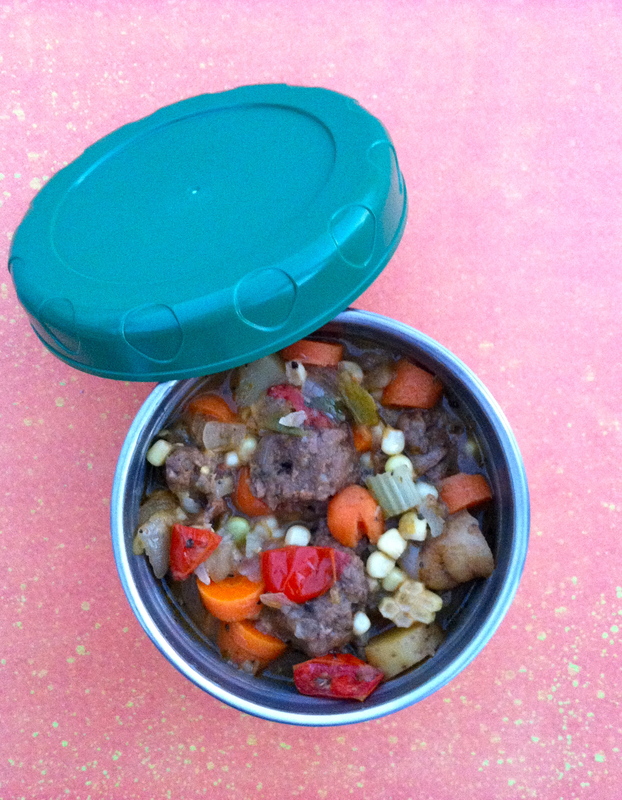 Last night’s dinner was Gardein brand “beef” tips made of vital wheat gluten and cooked in vegetable broth with a mixture of vegetables including potatoes, carrots, fresh corn off the cob, celery, edamame and tomatoes with some spices added. We had a rough morning in our house yesterday, and I failed to get a photo of one of the lunches. 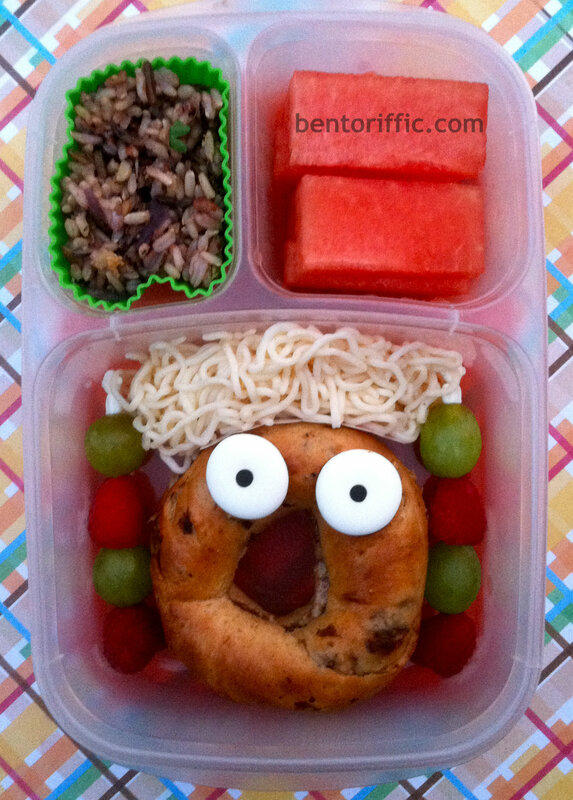 Miss G’s lunch was ditalini pasta leftover from dinner. 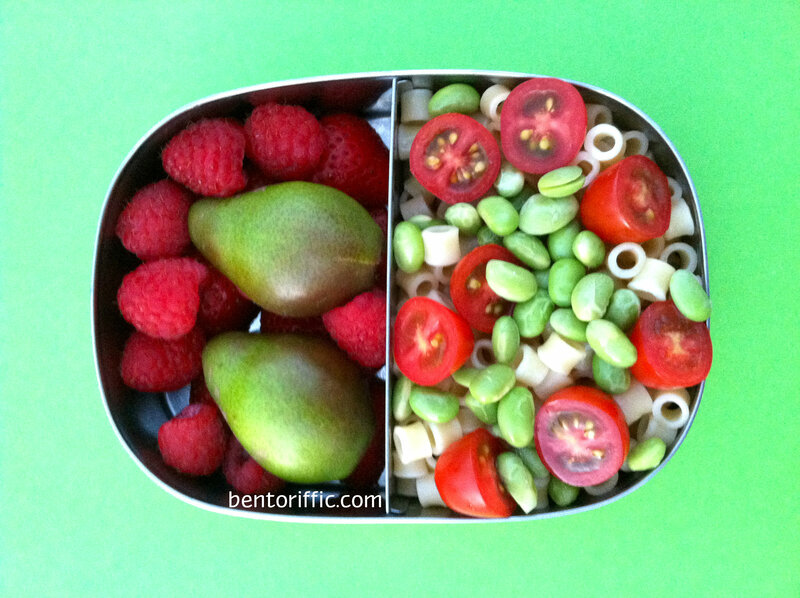 I added steamed edamame and sliced grape tomatoes in one half of her LunchBots Duo container and on the left side are raspberries and seckel pear halves. I decided to carve a clementine jack-o-lantern for Miss G’s snack. It’s not perfect, but it was fun to make and she really liked it. 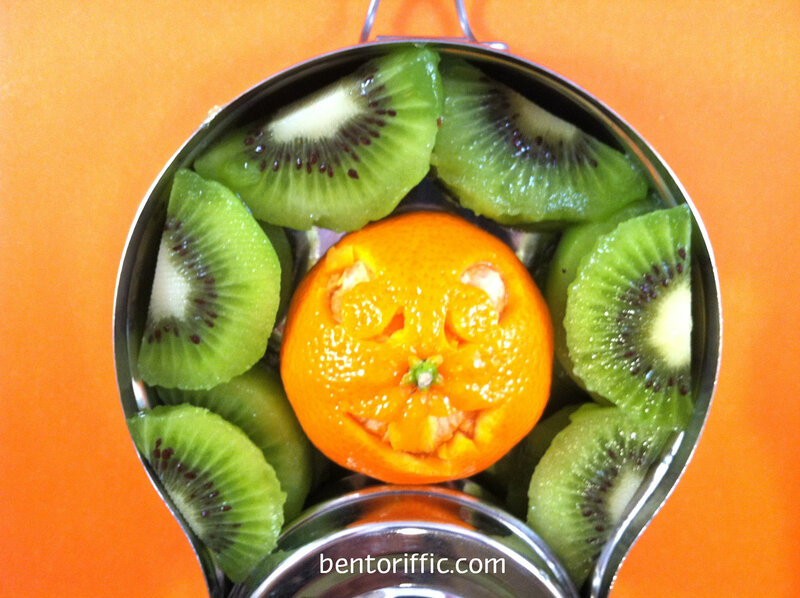 I placed sliced kiwi around the clementine and not shown is cinnamon applesauce as part of her snack in her Happy Tiffin bento container. More Halloween fun coming tomorrow! Miss G’s preschool is reviewing day in English this week, next week in Spanish. Wednesday’s lunch is leftover dinner. We had homemade fusilli pasta from Peperonata Pasta, a local company here in Sarasota that makes delicious homemade vegan pasta. 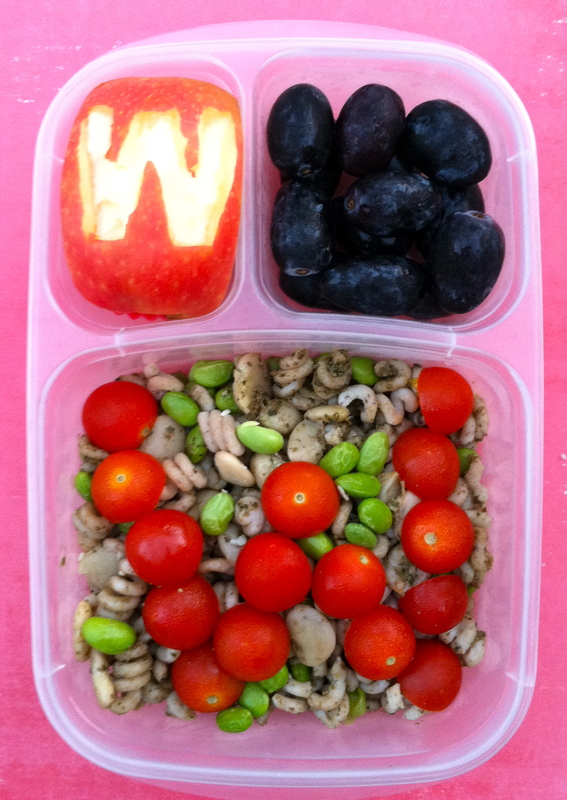 I mixed in butter beans and edamame, vegan pesto and organic cherry tomatoes in the shape of a W for Wednesday. 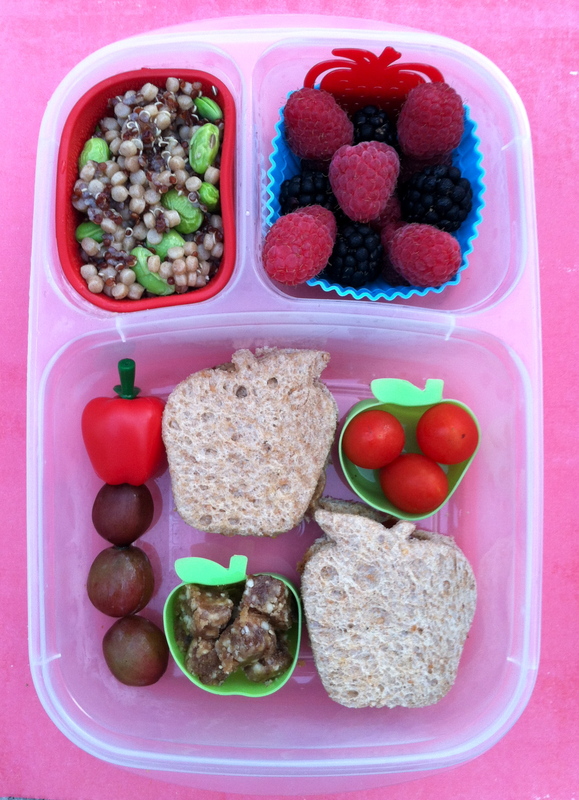 I used a cookie cutter to stamp a messy W in a large apple piece at the top left and the top right are seedless organic black grapes packed in her Easy Lunchbox container. 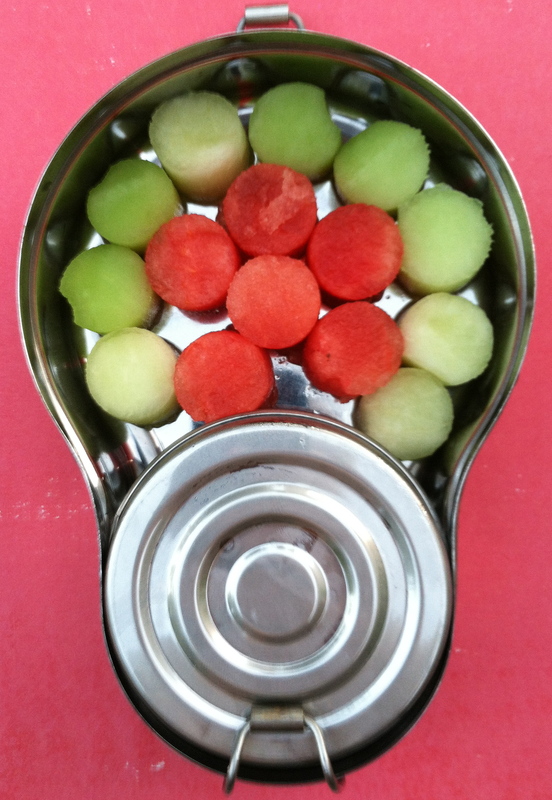 For her snack today, Miss G had circles of honeydew melon and watermelon with raspberry flavored So Delicious coconut milk yogurt in the small stainless container packed in her Happy Tiffin stainless bento. And Miss A (2) had the same smaller portions of the vegan pesto fusilli pasta too packed in her LunchBots Quad. 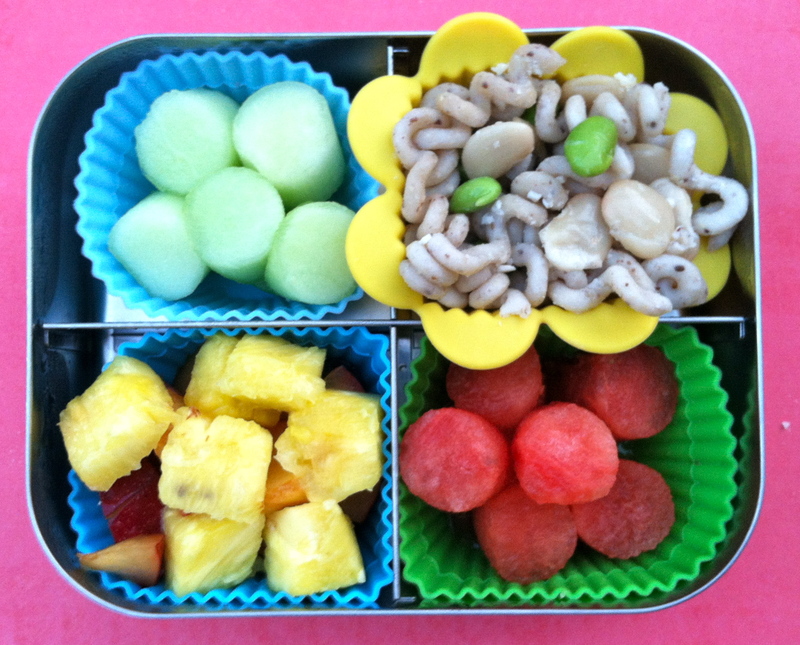 She also had honeydew circles, pineapple and plum pieces and watermelon circles in her lunch. Miss G’s first day in pre-Kindergarten was yesterday. I definitely had a proud mom moment realizing she was excited to go and well socialized enough to look at the positives of new friends and a fun new classroom. I also had my sad moment where I felt like I was saying goodbye to my oldest baby. She is definitely all girl now and ready to go out & meet new friends. It’s hard to let go sometimes. After all, it seems like only months ago when I was staring down at a new baby wondering, “What do I DO with her?”. There is no manual. As parents, we just do our best one day at a time. Off to school she goes. 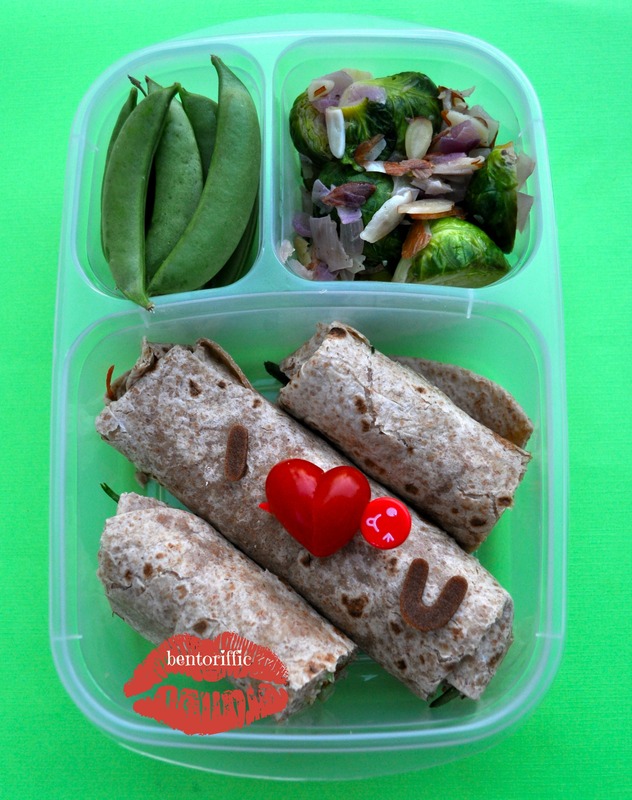 She will be in school until mid-afternoon which means she needs lunch AND snacks daily that I pack for her. She wanted her trusty almond butter and jam today, but I told her we’re working on more variety from now on. 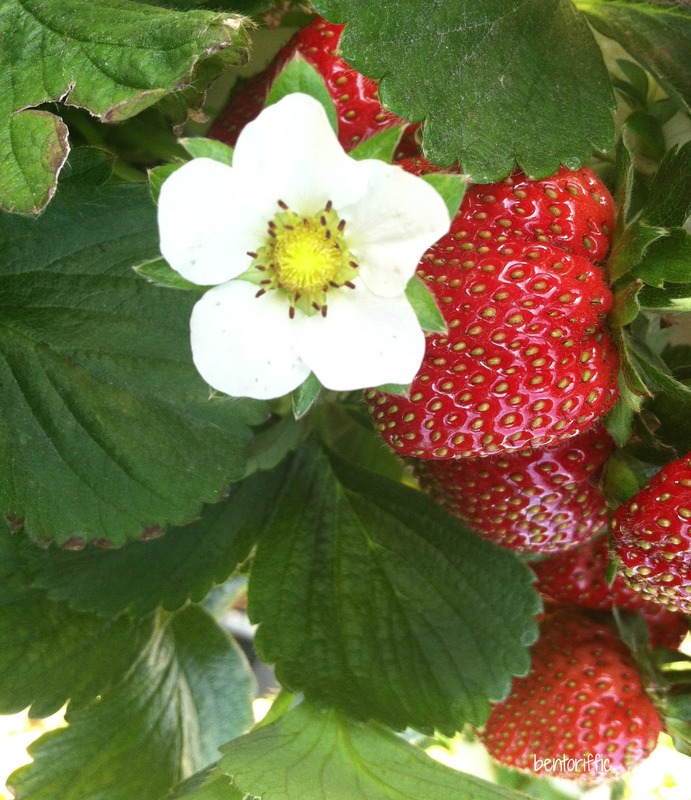 For today, the apple sandwiches are on Rudi’s Whole Grain bread with Justin’s Maple Almond butter and strawberry jam. 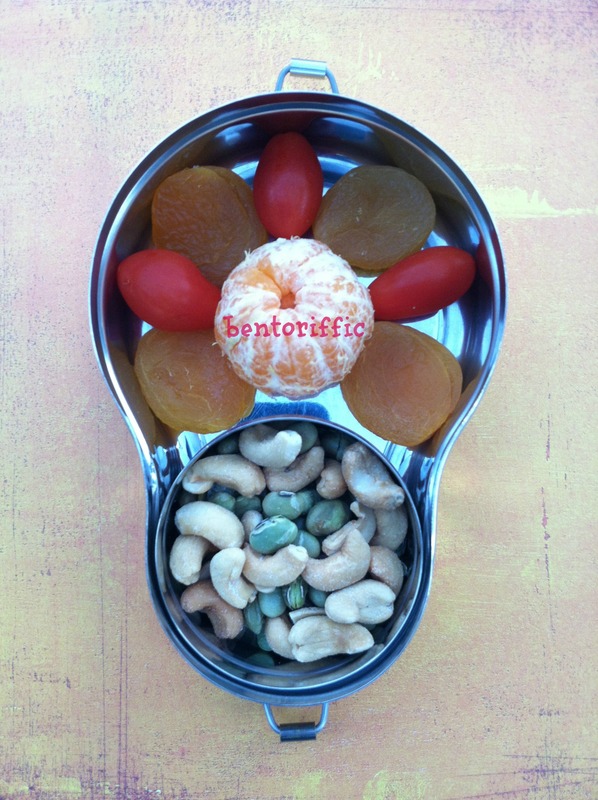 Along with the sandwiches are an apple pick of red seedless grapes, a silicone apple container with small Apple Cinnamon Larabar bites (I cut them into small pieces) and grape tomatoes. She also LOVES Israeli cous cous (top left) so I mixed it with quinoa and edamame which were cooked in vegetable broth. 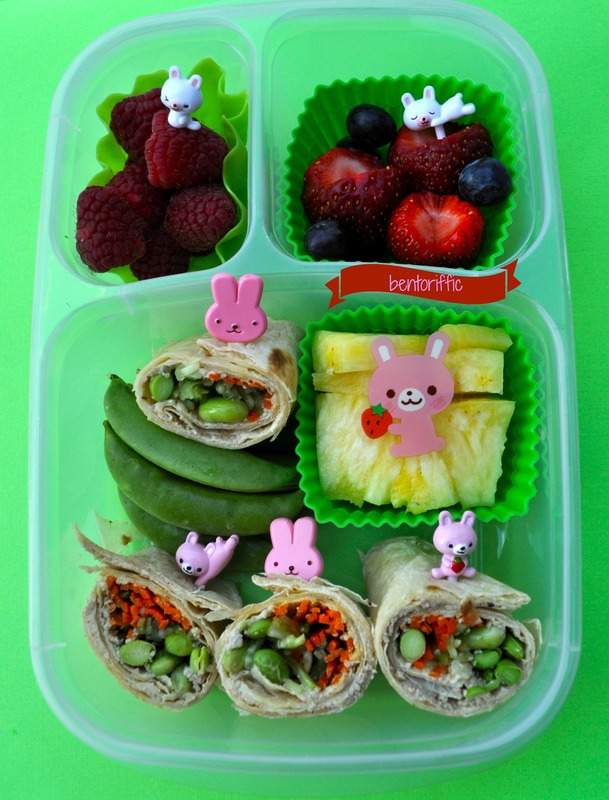 At the top right are blackberries and raspberries packed in her Easy LunchBox container. 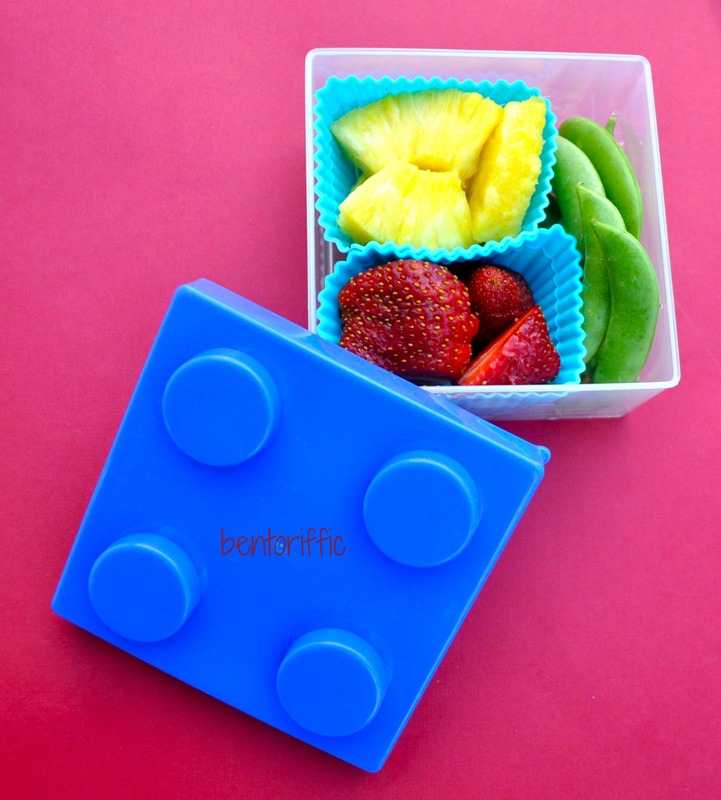 For her snack I used a small 2 tiered bento box. 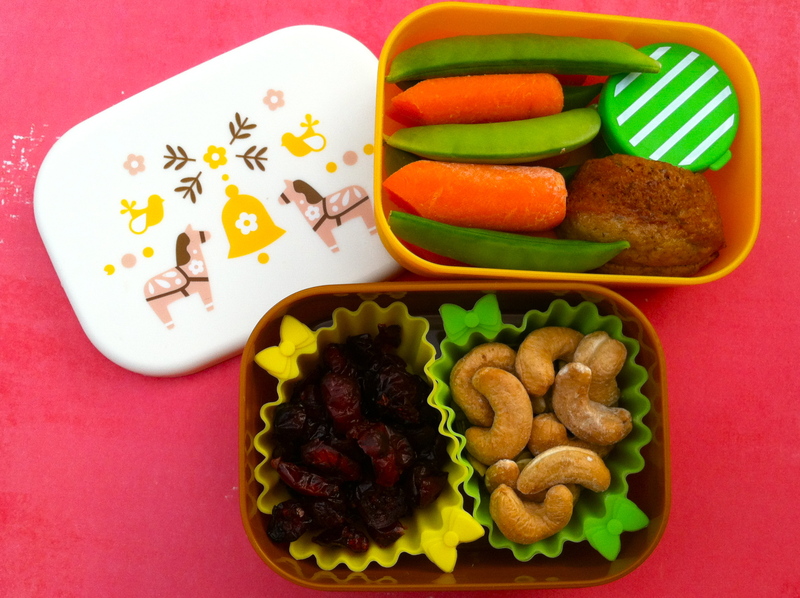 The top compartment is mini carrots and sugar snap peas. In the green sauce container is Tofutti sour cream for dipping and below that is a mini vegan apple cinnamon muffin. At the bottom are dried cranberries on the left and the right has sprouted pumpkin seeds and cashews. The hubby has a salad again. His mixed baby greens are arugula, tat soi, baby green and red chard, and baby bok choi. On top is a piece of teriyaki marinaded tofu, a yellow roma tomato, a green heirloom tomato and sprouted pumpkin seeds on the sides. 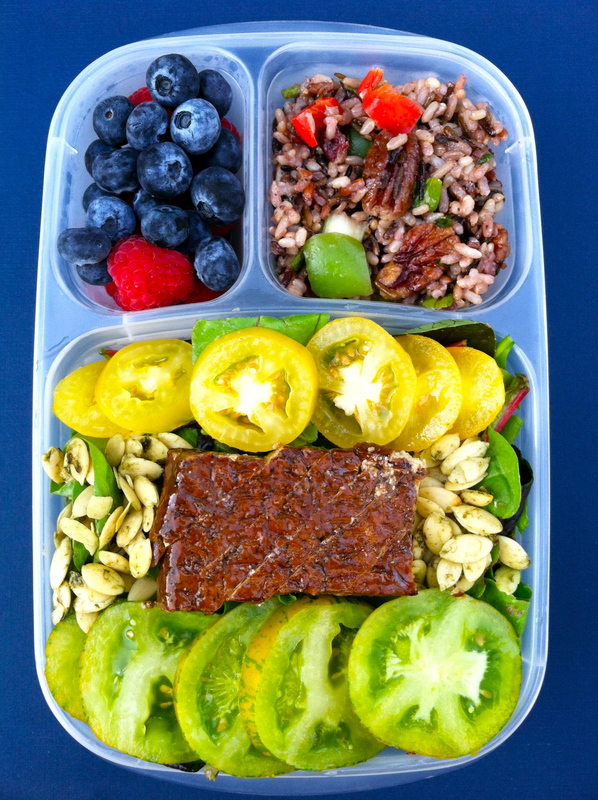 At the top left are blueberries and raspberries and the top right is a wild rice salad with red & green peppers and pecans packed in his Easy LunchBox container. Wishing all of my readers’ families a smooth transition during this back to school time! We’ve been hunkered down all weekend and part of this week just trying to stay safe and dry form Tropical Storm Debby. We’ve had torrential downpours, flooding and 60 MPH gusts of wind. 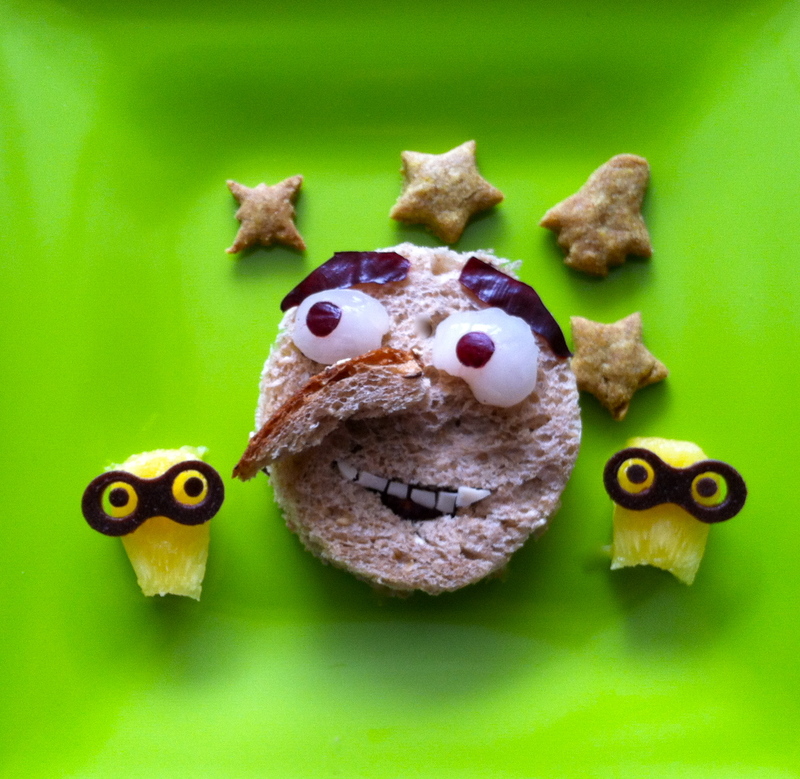 The girls wanted to watch Despicable Me while snuggling so I made a lunch to match. The sandwich is Gru the so called villain of the movie. He’s made of Rudi’s Nut & Oat bread. His nose is the bread crust, his teeth are vegan cheese, his eyes are Florida grown lychee halves and the pupils and eyebrows are made from plums. The stars and rocket are homemade biscuits from the weekend. I made the minions from pineapple chunks and fruit leather for the goggles and eyes. 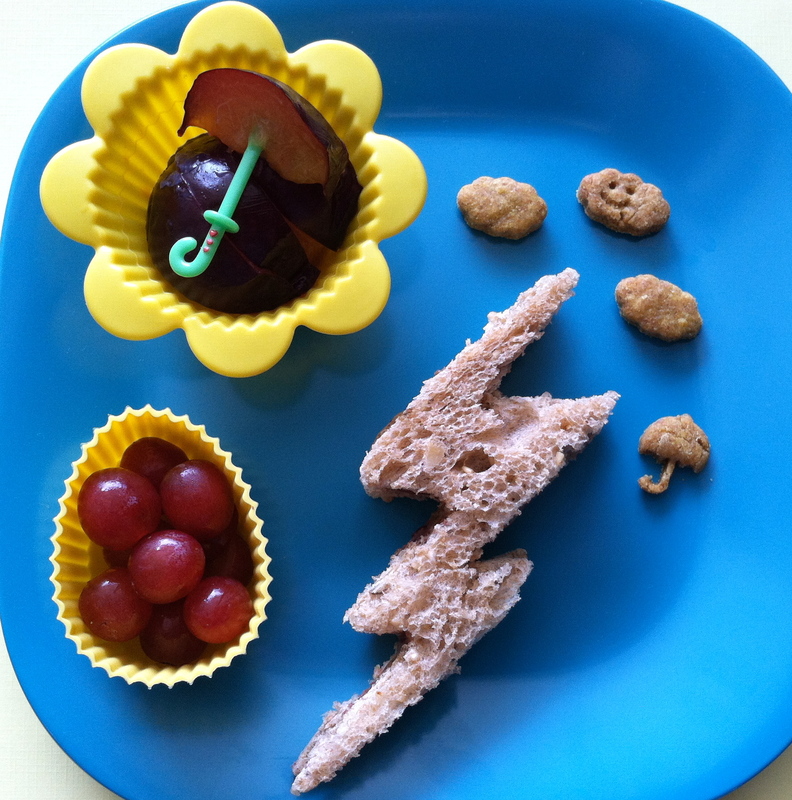 Our storm lunch is a lightning bolt made from the same Rudi’s bread. Above it are more of our homemade crackers shaped like clouds and an umbrella. In the yellow flower cup are plum sections with an umbrella pick. Below in the oval cup are red seedless grapes. And the sides for my husband today are a salad made from baby kale, spinach and arugula. At the top right is edamame succotash with edamame, corn, tomatoes, white wine, garlic, parsley, basil, jalapeno peppers, and pepper. 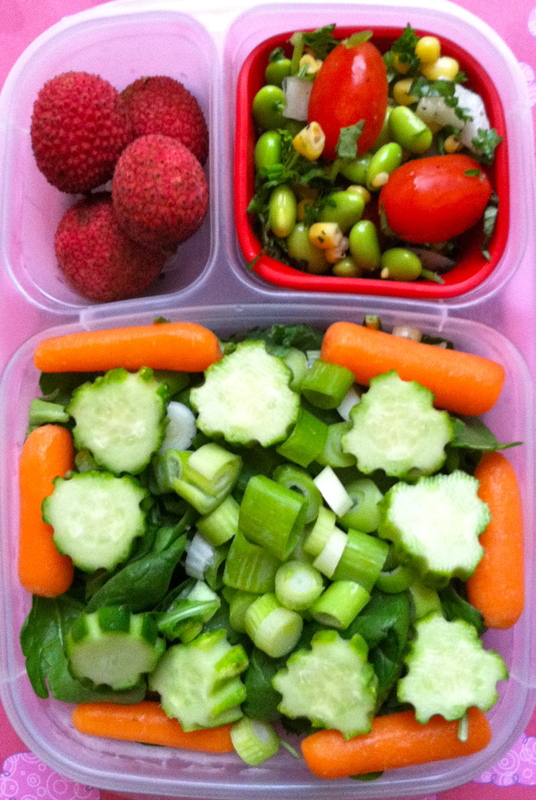 At the top left are lychee fruit unpeeled all packed in his Easy Lunch Box.